Today, we’re doing a special episode because I’m not interviewing anyone on the show. 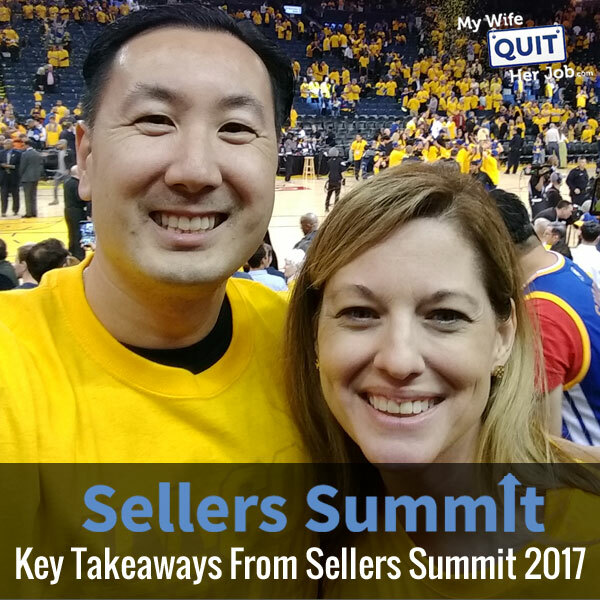 Instead, I brought Toni Anderson back on the podcast to do a recap of Sellers Summit 2017. Now if you don’t know Toni, she’s my partner in crime and she’s actually been on the show 3 or 4 times already. Anyway, the Sellers Summit is a conference that we throw every year and today we’re going to talk about what worked, what didn’t and some key takeaways. Today I’m thrilled to have Toni Anderson back on the show, and what we’re going to do is we’re going to talk about some of the behind the scenes actions from our annual ecommerce conference, the Sellers Summit 2017. But before we begin I want to give a quick shout out to Klaviyo who is a sponsor of the show. Now I’m always excited to talk about Klaviyo because they are the email marketing platform that I personally use for my ecommerce store, and I depend on them for over 20% of my revenues, and you’re probably wondering why Klaviyo and not another provider. Well, Klaviyo is the only email platform out there that is specifically built for ecommerce stores, and here’s why it’s so powerful. Now Klaviyo is the most powerful email platform that I’ve ever used and you could actually try them for free at mywifequitherjob.com/K-L-A-V-I-Y-O, once again that’s mywifequitherjob.com/K-L-A-V-I-Y-O. Now I also want to give a shout out to my other sponsor Seller Labs, and specifically I want to talk about their brand new tool Ignite which helps sellers manage their Amazon sponsored ad campaigns. Right now I’m actually using this tool to manage my Amazon PPC ad campaigns, and it makes things a heck of a lot more convenient. So number one I’ve always found it a major pain to generate my PPC reports on Amazon, cut and paste the data over to an excel spreadsheet and use pivot tables before I’m able do any analysis. Well Ignite pulls all that info for you automatically and allows you to easily see what keywords are working and what are not immediately, there is no need to manually create reports or play with excel. So let’s say one of my hankie keywords is bleeding money, well Ignite will alert me of that fact, and I can reduce the bid immediately. So bottom line Ignite makes managing your Amazon’s sponsored ads so much easier and the fact that they provide me with alerts means that I no longer have to monitor my campaigns like a hawk. If there are keywords that are doing well, well Ignite tells me to add them to my exact match campaigns, if my keywords are losing money, well Ignite tells me to either remove the keyword or to reduce the bid. So head on over to sellerlabs.com/steve where you’ll find awesome tutorials on how to run Amazon PPC ads and the opportunity to try Ignite for 30 days absolutely free. Once again that’s sellerlabs.com/steve. Now on the show. Steve: Welcome to the My Wife Quit Her Job Podcast, today we’re doing a special episode because I’m not interviewing anyone on the show today, and instead I brought Toni Anderson back on the podcast to kind of do a recap of Seller summit 2017. Now I you don’t know Toni, she is my partner in crime, and she’s actually been on the show three or four times already. The Sellers Summit is actually a conference that we throw every year. Actually I probably shouldn’t say every year since this is only year two, but it is a conference that we put on to teach people about ecommerce, and today we’re going to talk about what worked, what didn’t and some key takeaways from the speakers. So how are you doing today Toni, thanks for taking the time to be back on. Toni: Bang, thanks for having me again. Steve: So okay it’s year two, and I don’t know about you but I was kind of worried about hitting a soft ball slope, like year one went so well that I didn’t actually think we could do better. So how did you feel going on to second year? Toni: I’m glad you’re telling me this now and not pre-conference. I actually – I knew this year was going to be so much better and I think for two reasons and I know we’re jumping this a little bit early, but the mastermind that we did which was new that we added this year and the roundtables that we added this year. I think those two things in my mind were going to make this conference significantly almost more advanced than it was last year. Steve: I just remember and for people who aren’t used to running conferences, I remember Toni put down and increased hotel block, and the way this works is like you’re committing to filling certain rooms in the hotel. I got really nervous I remember when you did that. Toni: Yeah and then that makes me nervous whenever you get nervous. Steve: When I get nervous, no you’re supposed to be the rock, remember? Toni: Right, I try, I try. Steve: So I actually thought that this year’s conference was significantly better this year, like we kind of took the same no fluff attitude, and put together another actionable curriculum based conference. And I actually thought that the quality of the attendees was better than last year’s, and what’s cool was that a bunch of the attendees from the previous year actually launched profitable ecommerce businesses within a year. Toni: And I think that was really exciting to see people that we met the first year and these are people you might have known them from your course but for me they were complete strangers, to meet them in year one and then see them again in year two and hear about their success. To me that was probably one of the best things about the event and the people that were there. Steve: Yeah, and we probably have about Dean in the past, but he basically launched a product I want to say two months after last year’s summit and then he qualified for the mastermind this year which meant that he made $250,000 in revenue within a year which is pretty cool. Toni: And I think that’s exciting because I think people like Dean and then we had Carlos [ph] who hit a goal, Chris Nelson who wanted to be able to join the fuel forums, that was one of his goals after year one, and I think to see people take action and have those success based on either the relationships they made or the stuff that they learned at the event, to me is kind of why we do this. Steve: Yeah, the only thing for me is I felt like it was a lot more work this year, maybe it’s because I ended up speaking four times, so I never felt like I could relax, like I always had this anticipation of having to get on stage, but I had a blast, I had a blast. Toni: You should stop signing yourself up for sessions I feel. Steve: Maybe we should have you do more sessions; I think that’s the kick, because people did like your talk a lot according to the surveys, so maybe you should do even more. Steve: So one thing that I kept getting complimented on was actually the networking aspects of the conference. I actually didn’t feel like we did anything differently than last year, like we catered in lunch, we had cocktail parties every night, but for some reason everyone said the networking was even better, what are your thoughts on that? Toni: It’s funny because I agree with you, that was the one thing that we didn’t change at all because I think you and I both know the power of networking and know that some of the – the reason why you attend the conference because you can buy the virtual pass, and you can get all the information in a recording that everyone that attends is getting. But the real value in attending the event is the networking and being able to sit face to face with speakers, with other attendees, people that are more successful, people that are just same level. I think that’s the thing, the value that you get from actually making the commitment to attend an event, and so I thought it was funny that people thought the networking was so much better because we kept it exactly the same. Steve: Actually one thing – this is candy [ph] right now, one thing we did do differently was we invited the speakers from last year to come again without even having them talk, and so they were just hanging around and answering questions for everybody. Maybe that was the difference, I don’t know. Toni: And I think that’s a great point and I didn’t think about that at all, but I think definitely and we love our speakers, like we want all of them to come back every year even if they don’t have something new to share just to be part of the event. I think another thing that we did this year that made it easier for people to network is in our private Facebook group we had people starting doing live, Facebook lives or even not if you didn’t live video you could just post a video that you had prerecorded, and I think there were people that showed up at the event who felt like they knew each other even though they actually hadn’t met, but because they had done a video, just everyone seemed more relatable right off the bat. Steve: Yeah I think last year FB live wasn’t that prevalent, right? Toni: Yeah, in fact I think it was maybe just launching. Steve: Yeah, okay maybe that was it, yeah we all did videos, which was great and the attendees started doing videos too. So I actually felt like I knew some of these people even before the event even started which is pretty cool. Toni: And I think even though you see people’s picture on Facebook or on their webpage, seeing them talk and interacting with them even on a short Facebook Live is really – it makes a difference in then meeting them in person, because you feel like you already know them even if it’s just a little bit. Steve: Mm-hmm and I think the other attendees felt that too, and I remember people started kind of getting together and saying, hey you want to grab dinner even people like well before the event even started. Toni: Yeah and that was something we did different this year too was we created those dinner spreadsheets so people could sign up to do dinner groups and sometimes they were topic based like advanced Amazon sellers who were wanting to transition to your own website, and sometimes it was just people that wanted to meet and hangout and just talk general ecommerce. And I think that was helpful too because it allowed them to organize pre-event as opposed to five o’clock, everyone is tired from the day and everyone is trying to figure out, know one has each other’s number or contact information and it’s a little crazy. Steve: Yeah, I know that was pretty key because I remember last year one of the feedback that we got was it was kind of intimidating to go to a conference where you don’t know everyone, and so by allowing people to kind of connect beforehand, that actually added greatly to the networking I guess at the event. Maybe that’s what did it, I don’t know. Toni: Yeah and thanks to Susie, who coordinated a lot of that for us. She was one of our attendees who was local, and she did a really great job in really getting those groups together. Steve: Yeah she coordinated all the dinners if I recall, right? Steve: So before we get into the kind of like the key takeaways, let’s start by talking a little bit about what we did differently this year. So first of we kind of kicked off the conference by running a special mastermind session, so basically we sold a special pass where we screened attendees to make sure that they made at least $250,000 in revenue. Then we locked ourselves in a room, catered in food and we spent the entire day helping each other with our businesses, like everyone took turns in the hot seat, told the group about one strategy that was working very well for their businesses, and then one problem that they’ve been struggling with, and then everyone in the entire group helped them solve that problem. What was really awesome for me was how open and how comfortable everyone was and how willing they were to reveal their problems and their triumphs and even reveal their products on Amazon, like typically people tend to be a lot more secretive about their Amazon products. I actually ended up learning a lot myself, and by the end I actually felt really close to the mastermind attendees. What was your experience Toni? Toni: I totally agree, basically the exact — because I know we were in separate rooms but I was – and I’m not as ecommerce advanced as some of the people even in that room, but I loved that they were so willing to share strategies because I think a lot of times in some of these Facebook groups that we are in, people will share just enough but not the full strategy because they don’t want to give things away that could hurt their sales, and I felt like that was not the case in the mastermind groups at all. People were so honest and really, really willing to say, hey you should try this or you should do this because it’s working for me and here is why. Steve: Yeah, and I think we didn’t have any competitors in the mastermind groups, so we did really a good job of screening those people out so that people didn’t really feel like anyone else in the room was directly competing with them, which allowed everyone to kind of reveal their niche and all their strategies, which in a lot of cases are applicable no matter what you sell. Toni: Definitely, and that was what was fun and I think it was also fun to see people help other people make the connections maybe with a tool or a person that could help them grow their business, and that happened a lot in our room just sharing even the resources. Steve: And there were some pretty high powered companies in there making seven even eight figures in revenue which is pretty cool too. Steve: One other thing we did for the masterminds, we actually invited some of the speakers to help moderate and just lend their opinion to kind of jumpstart stuff, to kind of facilitate, and so I think we had Mike Jackness, we had Dana, we had me, you, we had Jeff Cohen and Rawse [ph]. And so it was great, everyone lent really strong opinions, a lot of people came in actually doing really well and they just needed some direction on where to focus their efforts, and I think collectively we were able to steer people in the right direction on where to focus their efforts next. So let’s talk about the next major change, the roundtables. Now, this was actually Toni’s idea, so I’ll let her describe it, and I just remember being very skeptical at first. Toni: I think that’s an understatement for sure. One of the things that I think really helps people is that when you go to a session and you are in a group with 50 to 100 people in a session and the speaker has time for Q&A at the end and it’s usually not a lot of time, maybe five to seven minutes, there is a lot of people that either they just aren’t comfortable asking the question, they don’t want to ask a dumb question or they don’t want to – I think we’ve all been in a room where the person asks these super specific only applicable to their exact business question and everyone else in the room is eye rolling and slumping back in their seat. So the roundtable allows for attendees to sit in a very small group, eight to nine people, with a speaker or an expert and talk and ask those really specific questions. They’ll ask the questions that they maybe were intimidated to ask in the session and get a lot more in-depth of an answer, because we all know that when you have five minutes for Q&A at the end of the session, the speaker is trying to get to three or four people just to be courteous and to be able to move throughout the group. I think roundtables allowed people to stay with the speaker for an hour and really talk in-depth about whatever topic they spoke on at the conference. From the feedback we’ve received, people really enjoy getting that, it’s almost like one-on-one, it’s not exactly one-on-one but I think people loved being able to sit there, ask a question, then ask the follow up and then have someone else in the table either give more information like being able to help or even then piggy back on that question and ask another question. It really allows for a great discussion for a pretty extended period of time on a specific topic. Steve: I remember in my table I think there was only like ten people, was that the case for most of the tables? Toni: Everybody had ten including the speaker, so nine was the max of the attendees. Steve: Okay, I just remember like we talked about – so my topic what I talked about was getting past Amazon and then getting sales in your own online store, and I remember we started out my roundtable kind of talking about some of the strategies that you can do on your own so as to get customers, then we started getting kind of philosophical and like why are we doing all this stuff, how much money is enough, and it actually turned into a really interesting discussion that was really thought provoking for me and the rest of the people on my table, I don’t know, what was your table like? Toni: That’s funny because mine was the exact opposite. So I did a roundtable on Pinterest, and we basically opened up people’s Pinterest accounts, went into their ad manager, adjusted things, found ways to tweak, add copy or just go into their accounts and actually working on it right and in there, which I think is the benefit of that small group, because obviously you can’t do that in a classroom setting of 50 or 100 people, but you can easily do that when you have a table of six or seven. What was nice is Carol [inaudible 00:15:53] was in my group and she is very, very savvy on Pinterest and so she was actually able to help people at the table as well, so it kind of turned into this Pinterest mastermind really all sharing ideas and things that were working and tweaking and giving advice on how to make things better. So ours was very practical, everyone had their computer open, we were all logged in to the Pinterest dashboard, and we were making changes at the table. Steve: Dude that’s cool, that’s really cool. One thing that I actually liked was all the speakers – because I kind of went around to the tables afterwards and kind of talked to the other speakers, and they all found it really rewarding themselves, and the fact that they were just present and they went to all the events, they stayed for the roundtables, I think that just had a tremendous impact on the attendees as well. Toni: I think so too, and one of the fun things about the roundtable and obviously we did this towards the end of the event but we still had one more networking event after that is that I think it gave people that – and I’m an extrovert, I think you are an extrovert, it’s not hard for us to approach people that we don’t know, but I think it is hard in a big setting like a conference to just walk up to a Scott Walker or Greg Mercer if you’ve been following them for a long time and you’re almost a fan, right? But when you sit at the small table with them for an hour and you really feel like you get to know them, then later on when you’re at the networking event that night they are a friend, you’re not a fan anymore. So it changes the dynamic of the relationship and I think it gives people more confidence even to continue those networking and masterminding throughout the rest of the event. And compounding on that point, a lot of us kind of stayed out really late at night, and I remember I was hanging out with Mercer and Jackness with a bunch of the attendees and Mercer, he’s kind of like a low key guy, but you get him like past midnight and he’s hilarious. It was really good hanging out with everyone and the attendees and we all became really good friends just from hanging out late at night. Toni: I have to take your word on that one. Steve: I’ve got video in case Greg ever messes with me, I got a couple of things that I can use against him. Toni: And I think that’s what makes our speakers amazing and I think they’re amazing even without this, but you and I both have been to events, actually have been together where the speaker comes on the stage, gives a great talk, you and I are both supper impressed and then the speaker is MIA for the rest of the event. That just is not the case with our speakers, I mean they are available and around, you’re eating lunch with them, you’re networking with them, they are going to all the other sessions, like they are sitting there in the sessions but they are not speaking. I think that’s really valuable because, one it makes them so much more relatable to the attendees but then two that shows everybody that they are still learning too, they’re still wanting to grow their business, none of our speakers has arrived. And I think they are very good at letting people know, hey I’m only speaking because I’m an expert in this specific topic, but I still need to learn all these other things. Steve: Yeah, I think I’m going to take some credit here. I think it’s because all of us are just friends and a lot of us go to the summit just to kind of hang out, and so it’s not like we just want to speak and then leave, we actually want to hang out with each other, and the attendees are really cool too. It’s kind of just a given atmosphere, it just happened naturally, it’s not like it was planned but it just happened. Toni: Well and I think – and we won’t say any names but you talked to some pretty big speakers who wanted to speak at our event that we basically turned down because they wanted to fly in and out. Steve: That’s correct, actually that’s one of the first questions I always ask, like are you just going to give the speech and take off, or are you going to stick around and hang out? It’s almost like a requirement to stick around and hang out. Toni: But there is still so much more, I mean obviously the sessions were very valuable but the amount of value that the attendees get from the extra is – you just can’t really even put like a value on that to me. Steve: Yeah, absolutely. All right, so we switch gears a little bit and talk about some takeaways? Steve: Yeah, so I’ll start and there’s one statistic actually that Greg talked about in one of his talks, I just want to talk about a little bit. In one of his slides he said that the people who start on ecommerce and keep at it for a long time always do better, and he quoted this statistic which was pretty cool to me, “For people selling less than 18 months, 50% of them made between $157 and $2,500 a month, but for the people selling more than 18 months, 50% were making between $1,000 and $12,000 a month,” which just goes to show that this is not a get rich quick scheme, you’ve got to really think about it in terms of the long haul, and if you stick with it, the revenues will only grow over time. Toni: That’s true, I wasn’t in his session, but that’s a great takeaway. Steve: Actually I wasn’t in but I actually watched all the videos after the fact. So here’s how we did it, so Toni and I obviously we couldn’t be in any of the same sessions because we had to moderate each of the rooms with the speakers. So we run two tracks, and so Toni was in charge of one and I was in charge of the other, so between the two of us we saw all the talks, how come you didn’t see Greg’s, where were you? Toni: I was watching my kid’s graduation right outside the room via Facebook Live. Steve: Oh I didn’t realize that, okay. Toni: So I stepped out, so I missed — I saw the very beginning and I saw the very end, but I missed the mid of it because I was outside on Facebook Live watching my kids graduate, but not winning parent of the year for that, but anyway thank goodness for Facebook, right? Steve: See yeah Toni always takes one for the team, and she always lets me know it when she takes one for the team. Toni: Yeah, you didn’t even know that till right now. Steve: I didn’t know and I always sacrifice my birthday. For some reason this is second straight year where I’ve been celebrating my birthday in a hotel at the Sellers Summit. Toni: Yeah but you won’t let us eat your cake, so come on. Steve: Yes, yes I don’t like attention for birthdays these days. Toni: I know. One of the takeaways I had and this was from Dana Jaunzemis who is I think I want to be her best friend, I don’t think she feels the same way about me, but I’m pretty sure that that’s how I feel about her, and I don’t think she does anything publicly as far as she doesn’t have a course or a podcast or anything like that, but if you ever have an opportunity to hear her speak and interact with her, I highly recommend it. She is brilliant. I’m not sure where I – I don’t know if this happened in just a conversation, networking or within her session, but she talked about the tasks that we do on a regular basis on our business, and she said she categorized all her tasks to daily, weekly and monthly, and she basically built her business so that anything that had to be done daily or weekly was something that she never touched and she wasn’t involved in it at all. The only task that she was involved in were the monthly tasks, and I feel like for those of us who have been doing this for a couple of years and our business has been growing but now we’re sort of at that next level, I’m realizing that in order to move to the next point in my business I have to pull myself out of the daily and weekly tasks, because that’s where I’m focused as opposed to focusing on the big picture items that will actually bring in more money. For some reason the way that she said it, it was one of those light bulb where I thought, oh this is what I’m doing wrong right now, this is why I’m feeling very overwhelmed with some of the things that I have to get done. So that’s on my list to start implementing this summer is to work on eliminating myself from those daily and weekly tasks. Toni: Most profit, most profit. Steve: Most profit, that’s correct yes. Toni: Yeah, I also want to build my little profit metrics too, that’s on my list as well. Steve: Yeah and — actually switching gears, I watched Manuel Becvar’s talk last night, he talked about product sourcing and I kind of liked his no nonsense approach to it. Steve: And there is this one story that he told during his talk where he got into some disagreement with his vendor, they sold them some stuff with defects and I think – and you can correct me if I’m wrong but I think he went to the Canton Fair, found this vendor, sat in his booth and would not leave until the vendor was willing to give him a refund or some sort of concession. And everyone that came into the booth, he went, hey, don’t work with this guy, he’ll screw you over, and then within like a couple of minutes the vendor kind of caved, and gave him what he wanted, that was a pretty cool story. Toni: Yeah, you could see the room too getting very excited when he was telling that story, because everybody wants to be that guy that will do that but nobody is really brave enough. And Manuel if you know him, he’s very soft spoken, he’s very quiet, and to think of him like sitting there and doing that was pretty cool. Steve: Yeah I know and not only that, it was just really interesting to see his approach to the whole sourcing process. It’s very structured, like when my wife and I do things it’s kind of all based on like the relationship, we don’t have like a whole bunch of these contracts and it was just really interesting to see all these formal documents that Manuel had with this vendor as well. Toni: I loved his talk and one takeaway I had from his talk, and it’s funny because I feel like every talk I took something away, but sometimes the takeaways were really small but I think will affect my business in a big way. But one of the things he said was he gives a lifetime guarantee on all these products that he sells, and he said, I see these people on there doing 90 day guarantee, or whatever, a year or six months. He’s like lifetime, the wording matters and most people are never going to come back to you in five years and ask for the guarantee, they are just not. He said but to just say lifetime over some other period of time with an end to it makes a difference when people make the purchase. Steve: Yeah actually that – I think L.L. Bean has that same guarantee, right? Toni: Yeah I think [inaudible 00:26:12] might do something similar too, but I know L.L. Bean is lifetime. Steve: Yeah totally. Interesting I actually did not pick that up from his talk. Toni: Yeah that was the moment – because we don’t do a lifetime guarantee and we make a big deal that we have a guarantee and I thought this is silly, because if someone emails me in a year I’m still refunding them or replacing it, I’m not going to hold them to whatever we say we are doing anyway. Steve: Actually that’s true, so in that respect you may as well just offer the lifetime. I didn’t think of that actually. Toni: Yeah, that was one of those moments where I was like, uh that’s a good idea and I need to do it right now and I can because it’s easy to implement. Steve: I’m just trying to think of wedding handkerchiefs like they get a divorce, are they going to return the handkerchief to me, I guess I would take it back. Toni: Would you re-embroider someone else’s name? Steve: Yeah hopefully they’ll get married again and then in that case we’ll offer them a coupon. Steve: All right so let’s see. The next talk that I watched, and I’m pretty sure you weren’t in Brian Johnson’s talk, right, you were in the other one? Steve: Brian Johnson is known for just doing Amazon PPC and teaching it, he teaches a course. I loved how he defines specific guidelines on how to refine your campaigns, and the thing with Brian, he runs a whole bunch of different people’s campaigns, and so he actually had metrics defined to see how well you were doing like in terms of click through rate, what your conversion rate should be and that was kind of eye opening for me because it gives you some metrics with which you can gauge your own campaigns, so I thought that was really cool. Toni: That’s on my list to watch this week because I’m not a great Amazon PPC person, so I’m excited to watch his. Steve: So what was going on at the same time as Brian’s, I can’t even remember, was that Brandy’s maybe? Toni: I do not remember, hold on I can look at my – I can probably look at the calendar. Toni: It was Greg Mercer, he was doing that. Steve: Oh it was Greg’s okay. You were at graduation, that’s probably why. Toni: So one of the talks that I will probably watch six times on video was Bill D’Alessandro’s. He did a talk on automation and he automates I feel like everything in his business, and his talk made me realize that there was a lot of things that we have people involved in that don’t necessarily need to be involved in it, and that there are tools that we can use that make the job actually much more productive – it’s much more productive to get it done with the tool as opposed to a person, and then you still have that person for when you get to a certain point but there is a lot of things that you can automate in your business. The amount that he does is like ridiculous levels of automation, but I could see even in his talk how I can just make three or four small changes in automating some things that we do using some pretty inexpensive tools. Steve: Yeah, actually Bill and I kind of have the same philosophy and he’s just taken it to the next level, like I’m pro like a computer and try to get the computer to do as much as possible and not rely on humans, and he just took it to a different level. It’s really obvious like in his house, I don’t know if you ever talked about this with Bill, but in his house he has every single device and appliance automated with his Amazon echo. So he can walk in the room and say, turn on the TV, or play this music or whatever and he has all these devices hooked up to it, and so as a result he spends most of his time like gardening his vegetable garden with his girlfriend. Toni: In his talk there was so much information in his talk that I feel like even if you watched it a couple of times you would get something new out of it because there’s just — it’s a lot to digest but definitely opened my eyes to some things that I’m not doing in my business, and I think most people that I talked to aren’t doing as well. Steve: Yeah totally, and then Bill’s business is kind of on a different scale, he’s got like six or seven child companies as part of his umbrella company. He really has to automate a lot with the stuff that he has, and he’s just done a really good job with it. Toni: Speaking of children, another takeaway I had was that a lot of people have their children work with them Steve. Steve: I unfortunately only have two workers and they are not of age yet, but actually I was surprised, so the running joke here is I always make fun of Toni because she employs her kids to do everything and then she pays them with like [inaudible 00:30:27] and food, and I was making fun of her and then all of a sudden like these other mums – it’s always mums, these other mums came and started raising their hand and posting pictures of them working with their kids too. There’s got to be some log into that, I don’t know. Toni: Here’s what I thought was cool; I’ll joke in the side on that was that it was fun to see the amount of people who did have it, like Dean’s son is working with him and his son is an adult and not getting paid in sloppies [ph], but it was cool to see the amount of people that did have their kids working with them and then their kids had gone on to spin off and start businesses. One of the girls Julie who was in the mastermind, she has a ton of kids but she has her younger kids are still working with her but then her oldest daughter has this six figure business span off from what her mum was doing. So I think that was really neat to see the people that had started this several years ago and now their kids are doing it too and their kids are actually pretty successful. Steve: I mean that’s great story Toni, but like when they are young, like just seeing the photos, they don’t look happy, they’re just like I guess I want to eat dinner tonight so I’ll pack these necklaces. All right so one of my favorite talks was Rachel Miller’s, and she talked about how to create a viral Facebook fan page and I was just shocked, I mean she’s created multiple one million plus fan pages, and it’s been amazing like she can take these Facebook fan pages and drive traffic to products and make a killing. I’ve actually since enrolled in her class and it’s just eye opening how she does it, you were at her talk, were you? Toni: I wasn’t and I wanted to be but you wanted to be there too. Steve: Oh no, okay usually I let you choose whatever talk that you want to go to. Toni: All right I’m not sure about that, but no I was actually in Bernie’s talk, and he gave a really great presentation on how to create these customer feedback loops, and one of the things that I thought was interesting is he has a tool called Efficient Era which you and I both use, and I realized in his talk that I was not using it to its fullest capability at all. What I really got from it is that when you get this data no matter what tools you use, what are you then doing with the data to upgrade your business? I think that’s where a lot of people get hang up is that they invest in tools, there are tons of them that you can use to develop your business, and then they don’t actually analyze the data that they’re getting from those tools and necessarily make changes. So I thought that he did a good job of giving people ideas about when you’re getting this data about your products or about your returns or about your customers, then what do you do to improve on that or improve on your products and things like that to grow your business. Steve: Yeah, you know I’ve actually taken a different stance on just stats over the years, like I try not to emphasize too much on the stats unless I’m going to actually do something about it, because traditionally in the past since I’m an engineer I’m like a big stats freak, but then I just – my wife actually started this, she’s like do you ever look at those stats and what have they done for us? And I don’t really have a good answer most of the times. Speaking of which Mike Jackness, he did a great job, he always makes fun of me in his talks and we had called a truce prior to it, but despite the truce he actually made fun of me again, so he’s got to pay back, he’s got to get some payback for that. But it was really interesting for him to talk about how he’s grown his ColorIt business to a multi seven figure business in such a short period of time using giveaways. My key take away from that is if we can create a rabid audience by giving away your product, like you’re giving them something away for free, they appreciate your company that much more, and they become rabid fans and they are much more likely to buy from you in the future. So I remember he was collecting email addresses and getting shares at some ridiculously low – like he was paying pennies on the dollar for email addresses which is pretty amazing. Toni: Yeah, and it was interesting because he and Scott Voelker, I think Scott went first and then Mike spoke right after him and it’s like their sessions piggy backed off each other and we didn’t really know that that was going to be the case. But Scott talked about how to launch products in a non review world now that Amazon has made the changes and you don’t have incentivized reviews any more. He had some really great strategies for basically using contests and giveaways to launch a product – not giveaways but contests to launch a product and how he had set up these landing pages and the whole – it was neat because he actually walked people through his case study that he had done. I cannot even remember the product that he was launching, maybe he didn’t even say it, I’m not sure, but he walked people through how exactly he went about building the buzz and everything around the product to then naturally get those reviews as opposed to the old way. I think that the key difference between both of their strategies was Mike was giving away his own products and I think Scott was giving away products that were related to what he wants to sell, and both strategies ended up working pretty well. Steve: I think they were Jordan’s, right, or something like that yeah. Toni: Well, they weren’t Lebron’s, right? Steve: They weren’t yeah, yeah; no one wants those any more. Toni: But you went to Steve’s with Instagram and Facebook ads. Steve: Oh yeah, so this was like a more advanced talk, so in order to get stuff out of it you actually had to understand all the fundamentals of Facebook, and what was key with his – so Steve – so the reason why I had him speak was he actually helped me with my Facebook ads. The guy knows a lot, and he’s worked with a lot of large companies, and really the key these days for making profitable Facebook ads is video, and kind of how to structure campaigns in such a way that you can bring people back over and over and over again until they are ready to buy. So it was a pretty eye opening talk for me. I know a lot of people in the audience it was a more advanced talk, but very valuable if you even dabbled with remotely with Facebook ads. Toni: Well, and then we had a video marketing company with Gen Video there and I know you did a case study with them over Christmas time and I know I think you presented, I wasn’t in that talk but you presented it with Jason. Steve: Yeah Jason did most of the presenting, I just came on at the very end to kind of present my data, and these days like influencer marketing is huge. I remember if you guys listened to the podcast, I had Emmanuel Eleyae on, and he actually based his entire seven figure business on influencer marketing, so I was itching to try it, hooked up with Jason from Gen.Video, run my own influencer campaign and it was a success. I’ve already kind of documented a little bit on the blog, but we also gave a 401 talk at the conference about it which was pretty cool. Toni: And if I remember correctly the videos that you had were made for you with the influencer, can you now use these videos in your Facebook marketing? Steve: Yeah, so what is cool about Gen Video is one, you can actually have these videos posted underneath your Amazon listings, and also you have the rights to the videos, so you can actually take clips of it and then use them in your Facebook ads, you can actually post the videos directly in your site like outside of YouTube, and that’s one of the big value ads of using a service like Gen.Video. Toni: Yeah that’s on my list too, I was in a mastermind this past weekend and almost all we talked about was video on Facebook. Steve: Yeah, and it kind of ties in to Steve Weiss’s talk, video, video, video. I mean that’s like the future of Facebook; they’re really emphasizing Facebook Lives and other video formats. Toni: One of my favorite speakers always is Jeff Cohen from Seller Labs and his talk – it’s tough when you’ve got that 4:00PM time slot because everyone’s brain is exploding, but he’s always so informative and he’s a great speaker, and he just talked about evaluating your listings to figure out if you’re not selling like where that problem lies, whether it’s in your copy, whether it’s in your PPC, now where is the problem, is it your images, and he really walked people through step by step on how to evaluate your listings when items aren’t selling well. Steve: Let’s see who we’re missing here, Brad Moss, I don’t think you watched that one because you wanted to watch the other ones so I let you. Steve: But amazing talk, so Brad is a former Amazonian in charge of Seller Central and what was interesting about his talk was he has this perspective from the inside, he was running Seller Central, he knows what Amazon wants, and so in his talk he actually kind of broke down the necessary action items that you should take based on your output statistics of like the data that Amazon is giving you. I know that’s kind of like a cryptic description but it was really amazing because he has this inside knowledge of Amazon, he knows how things work and based on how your products are doing in certain metrics that he was measuring, he was able to tell you what you should do next with your listings and how to improve them. Toni: It was interesting to meet him and talk to him, and he did talk a little bit about this on the panel discussion at the end just how the mind of Amazon works, and I think everybody wants to really understand Amazon and why things happen the way they do, and he did bring a lot of really valuable insight. Steve: Yeah absolutely, and well we should talk about Cynthia a little. I stayed for Cynthia Stine’s talk and it’s always really interesting because she’s on the cutting edge of people’s accounts getting suspended. One takeaway and if you guys takeaway anything from this, like she was telling me that Amazon is really cracking down on certain things because there’s lots of mass fraud going on right now. So do not change the bank account that is associated with your Amazon account right now, because it will almost result in instant suspension right now. Toni: Yeah, I feel like Amazon is really security wise really beefed a lot of things up lately just in general. Steve: Yeah, and there is more to it than that, I mean she was just talking about what’s going on in the landscape, all the kind of evil things that sellers are doing right now and basically how to keep your account in good order so that you don’t get suspended, and what to do if you do get suspended as well. Toni: Oh that’s one of the things that I love about our speakers in general is they are all up there sharing tips and strategies that are all Amazon approved. So people aren’t getting up there and telling you things that are going to get your account suspended which I appreciate. Steve: Yeah and here’s what I like too, everyone there is actively selling, it’s not like they are talking about stuff there was like an year ago, everyone is actively selling and they are all up-to-date on the latest happenings. Toni: Well, and then you did a Q&A with Jared Stark from Law Trades, which I know people love getting free legal advice when they can. Steve: Yeah, so it was different because it was perfect timing because Amazon had just rolled out their new brand registry, and so we fielded lots of different questions on trademarks, what it covers, how much it costs and basically a whole bunch of these legal issues also where people were accusing other sellers of trademark infringement, patent infringement and what to do in these certain cases. So I actually learned a lot and it was free instead of having to pay someone like $300 an hour. Toni: That’s right, a free legal advice and you can’t turn that down. Steve: And of course we had Pam who talked about how to get products over to your warehouse from overseas, how to ship your products directly to Amazon’s warehouse for people who weren’t doing that already, always eye opening stuff. Toni: And what I love about Pam is that you can always find her during the event, so if you have any questions about logistics she is almost always available to answer those whether it be in a session or just walking around the event. Steve: And she’s always so willing to help, and what I really like about her company is that she really will hold your hand through that entire process. So if you’re brand new and you’re kind of scared about importing, Pam will definitely make you feel comfortable about it. Toni: For sure and I didn’t get to see your talk. Steve: Oh yeah, what did I talk about? So I talked about breaking the shackles away from Amazon and moving to your own online store, and I guess if there is one key take-away from my shop is that a lot of people start driving traffic to a website without having the necessary infrastructure in place because you have to have ways to get people back to your store over and over again to get them to buy repeatedly, and there’s other different things that you can do just to make sure – a lot of different things that Amazon does that you need to do as well in order for your own store to be successful. All right Toni I think that covers most of the talks right, am I missing anyone here? Toni: I think we got them. Steve: I think we got everyone, yeah so once again I know tickets for the Sellers Summit sold out really quickly; I think we sold out this year at the end of February because once again we limited ticket sales, and I think we had a pretty long wait list again, right? Steve: And so this year once again what we’re going to try to do is we’re going try to bring the conference to you guys. So if you didn’t get a chance to actually attend the conference we‘re selling virtual passes but we’re also doing a live Q&A webinar. So first of all, all the video sessions are available for purchase, you get them in HD, you also get an MP3 version and all the slides, but we’re holding a live Q&A webinar with a bunch of the speakers on June 26th. So right now we have myself, we have Mike Jackness, we have Jeff Cohen, we have Scott Voelker and we have Greg Mercer, and what we’re going to do is we’re going to solicit questions from everyone who either attended the conference or purchased a virtual pass, and we’re just going to go ahead and answer all those questions live on the webinar, and in addition we’re also going to be fielding questions live during the webinar and hopefully will answer all the questions that you might have on some of the sessions that were given at the Sellers Summit. Toni: We did this last year and it was really fun to be able to just — for our attendees and people that bought the virtual passes to be able to interact with them and get their questions answered by people that are really working on it right then and there. Steve: And this live Q&A webinar will be recorded as well and added to the repository for the virtual pass. So even if you end up missing the live session you will be able to watch it on video, and if you submit your questions we will be sure to get to them and your answer will be recorded on the video in case you can’t make it live. And finally the last question that I’m hoping to answer here is – I actually don’t even know the answer to this, you probably know the answer to this Toni, where and when is it going to be next year? Toni: We haven’t decided yet, we’re working on it. Steve: You always say we, but I actually have very little say, you kind of tell me where it’s going to be and when it’s going to be at. Toni: I’m working on it. Steve: You’re working on it, okay. So are we looking at like July to make the announcement or? Toni: We’re looking at July, well, definitely the timing of the event will still be probably a little bit earlier in May next year, I know people had some conflicts with high school and college graduation, so we’re trying to push it up a couple of weeks, and plus Steve for some reason doesn’t like to have his birthday with me, he’d rather have it with his friends back home, but we’re going to try to push it up a couple of weeks, and we’re just doing some final hotel scouting and we should be probably in the next couple of weeks putting the ticket up on sale. Toni: So get that page right Steve. Steve: I know one person in particular who was complaining loudly about the whole graduation thing, but she was a [inaudible 00:47:00] fan, so we didn’t really listen to her very much. Toni: We don’t cater to [inaudible 00:47:03] fans, sorry. Steve: So what was really cool and this is kind of how I want to close it, what’s really cool is Toni and I we kind of run this conference together and our reward for the last couple of years has been to go to the NBA finals, so this year we hit games one and two and both brought victories I might add. Steve: Yeah very fun, it was particularly rewarding to see us win it all, so go warriors. Steve: Okay, anything else Toni that you want to add, any other key take-aways? Toni: Just really a big thank you to our speakers and our attendees and our sponsors who really make the event what it is, I think it’s their – and that’s why I just like the word synergy, I really do think that them all working together really makes this event really special and something different than the other events that are out there. Steve: And special thanks to Liz who did most of the work, right Toni if I understand? Steve: Zack and Todd who handled a lot of our AV, and once again what’s funny about the Sellers summit, it’s like a family business. Toni brings in her entire family to help with the conference. I ended up paying them real cash though, was that supposed to be the case? Toni: It’s hard when they grow up, when your brother hits over 40, he somehow wants the paycheck, right? Steve: Yeah, what about your nephew though, Toni’s nephew did our video for us? Toni: Yeah, and I will say about the video because we’ve had a lot of questions about this and I know some people are still on the fence, is that the video is not just the slides with someone talking, you actually have a video of the speakers and the slides are then merged in together. So the slides will get big when they’re talking about something real specific on the slide and then you go back to seeing the speaker which to me I love. I love being able to watch the speaker actually talk and interact, and then see the slides when I need to, but sometimes it’s hard for me to watch recordings when it’s just slides and audio because if they’re off the slides you tend to sort of day dream, right? Steve: Mm-hmm, absolutely. Yeah actually that’s one of the big value adds like we didn’t really skimp on the video quality or anything like that, we didn’t just like take the raw footage and slap it on there, Toni’s nephew actually took the painstaking effort to edit everything and super impose the slides on top of the videos to kind of reproduce the live experiences as much as possible. Toni: And he listened to all the talks, so I fully expect him to be launching a business in the next year, right? Steve: See that’s the thing; see I think we should be paying him in slow piece, because he probably got more out of the talk than the money that it was worth, right? Steve: Yeah, anyways if any of you guys have any questions about the summit or the virtual pass, feel free to email me directly or Toni, that’s toni@sellerssummit.com or steve@sellersummit.com, and we’re here to answer your questions. All right Toni thanks a lot for coming back on the show, and yeah here is to the NBA finals next year once again. Toni: All right go warriors. Steve: Hope you enjoyed that episode. Both Toni and I are thrilled with how the Sellers Summit went this past year, and all the session videos are actually currently up for sale at sellersummit.com/virtualpass, and if you sign up by June 26th we’re actually doing a live Q&A webinar with four of the speakers at the summit to answer all of your questions. Once again that’s sellerssummit.com/virtualpass. Now for more information about this episode, go to mywifequitherjob.com/episode167. And once again I want to thank Seller Labs. Their tool Ignite is what I use to manage my Amazon PPC campaigns. Instead of the old tedious way of generating reports and analyzing your ad campaigns in excel, Ignite aggregates all that info for you in one place and allows you to quickly visualize your data to make decisions fast. Great job. I think this is a very insightful post….